I want to introduce a fun video game, it’s Wii Sports. Bundled with Wii, Wii Sports introduces a whole new way to play your game. Play Tennis, Baseball, Golf, Bowling and Boxing in the comfort of one’s living room. No ball boys scurrying about, no oil from the alleys to get players dirty and no rain to keep anyone from a day at the court, park or course. Use the Wii Remote controller to mimic the actions of swinging a racket, bat or club, roll a ball down an alley or bring the left jab. Players can use their own Mii caricatures in the game and play them against their friends’ Miis for a more personalized experience. As players improve, their Miis’ skill levels will increase, so that they can see exactly how much better they’ve become. People of all skill levels can pick up and play any of the games in the unprecedented Wii Sports package, making this truly a title for everyone! 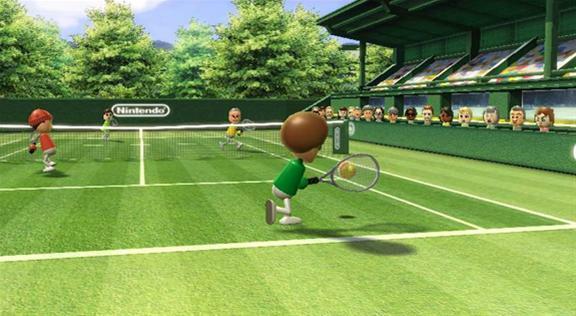 Tennis (1-4 players): Players grab the Wii Remote like a racket and swing – the game registers forehands, backhands, volleys, lobs, slices, spin and power depending on how fast the user swings and at what angle. Don’t worry about moving around the court to get to the ball – the game automatically moves players into position. Baseball (1-2 players): Players grip the Wii Remote like a bat and swat fastballs out of the park, or fire a fastball over the plate with a flick of their wrist. Timing and bat speed will make all the difference between going yard and whiffing, so keep an eye on the ball and swing for the fences. In the two-player game, one player pitches and the other bats – all fielding and running is automatic, so that players can focus on the action. Golf (1-4 players): Step up to the tee, hold the Wii Remote like a golf club and swing naturally to smack the ball onto the green. The harder players swing the club, the farther the ball will fly. Be careful, though – if players swing too hard, their ball will fly out of control, so they should be sure to take some practice swings before going for the pin. After reaching the green, line up putts carefully, practice the stroke and try to hole out. 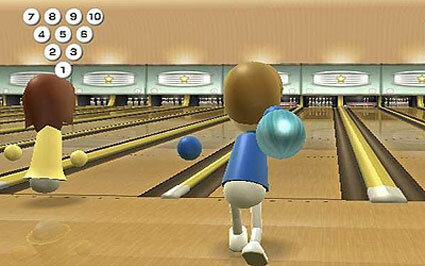 Bowling (1-4 players): Players raise the Wii Remote in their hand just like a bowling ball, and then swing their arms to roll the ball. The speed of the swing and the angle at which they release the ball affects the ball’s spin, so it will take some practice to master control over the ball and knock down the pins. 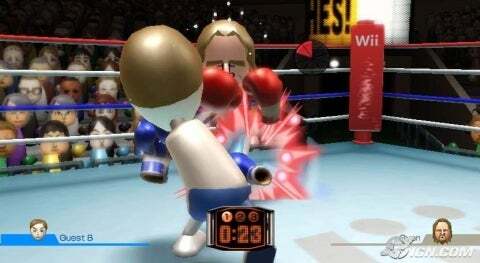 Boxing (1-2 players): Using the Nunchuk controller as one glove and the Wii Remote as the other, players dodge, weave and punch their opponents. Players hold their hands high to guard their faces or low to block their torsos. They punch high to hit their opponents’ faces or low to get under their guard for a body blow. Swing both arms left or right to sidestep oncoming blows and move into position for a devastating knockout. This is what video games should be: fun for everyone. Wii Sports offers five distinct sports experiences, each using the Wii Remote controller to provide a natural, intuitive and realistic feel. To play a Wii Sports game, all you need to do is pick up a controller and get ready for the pitch, serve or that right hook. If you’ve played any of these sports before, you’re ready for fun!